Much has been done and said for the cause against bullying. The news media has brought national attention and rightfully so, to a social dilemma that has been faced by young people since communities existed. This generation of younger folks has taken bullying and fear based manipulation to a whole new level it seems though. News stories of teen suicides, violence, and other volatile reactions to bullying have burdened my heart especially over the last several months. National campaigns have been launched to educate the general population about and to stand against bullying. With the advancement of social media and other technologies bullying has left the playground exclusively and lurks in a very public domain. I’m actually grateful for growing up without the internet and social community as it is today. It’s hard enough being a teenager that time of life is difficult, but with the added stress of constant exposure is unnerving. Nowadays, yes, I said nowadays, thus aging myself appropriatley, kids can bully each other in person and online. Every little detail of a teenagers’ life is now exposed for all their peers to see with the constant onslaught of social media. Much has been done to bring attention to this generations biggest social dilemma, bullying. It is encouraging to see celebrities step up and speak out. Messages of acceptance and unconditional love have and are taking little bites out of this problem. You were born this way, it gets better, support hotlines, etc. have given progress to no longer tolerating bullying. With all this attention one would presume anything that reaches this generation by the masses would harmoniously sing the song of intolerance towards bullying. I sit around a group of guys at work that review estimates and asses vehicle damages for a living. Most come from a background in body shop work. These are very “manly” dudes, very masculine. They poke fun at me quite often about my “pretty outfits” and “fancy ties.” They especially love to pick at me about having a GQ, Esquire, Details, or Complex magazine on my desk for extracurricular reading. The reason I draw this stark contrast is to say we have influenced each other by being around one another for several hours a day. One guy, although he won’t openly admit it, followed my lead and has started wearing suits and ties to work. We now have “suit-offs” anytime our executive leaders are in the office. Along the same lines, I find myself involved in conversations I’d typically feel like a displaced foreigner in. One such conversation is regarding wrestling. No not collegiate wrestling, but WWE (World Wrestling Entertainment, formerly WWF, World Wrestling Federation). Wrestling that boasts such characters as The Undertaker, The Rock, Shawn Michaels, and Brett Heart (yup, that’s a blast from the past). I’m always the guy calling out the fakeness of the “sport” but am met with passionate arguments that it is real and they are athletes. We always agree to disagree as our definition of real is quite different. My argument is that these giant men do not full on hit each other while entertaining and follow scripts. Their argument is that even if they don’t they are still hitting each other and it would still hurt, thus it is real. Our differences aside, this has become one of the typical Tuesday or Wednesday morning discussions in our office. 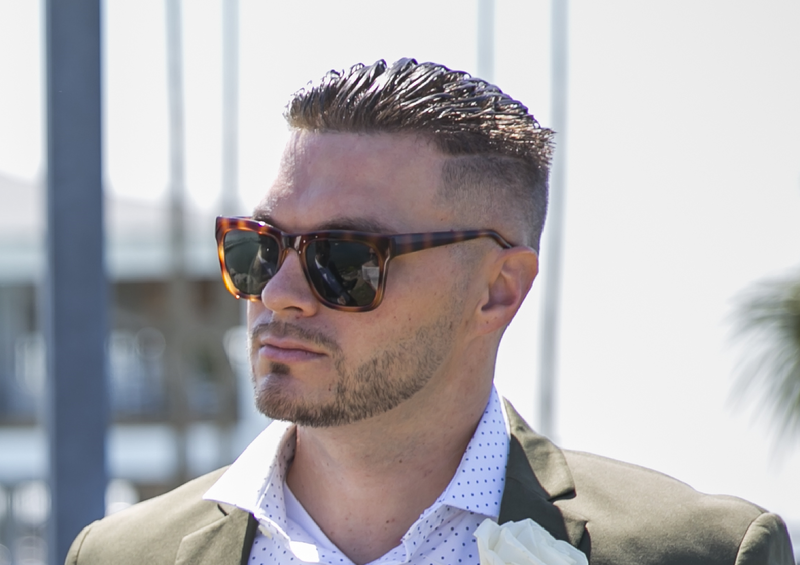 As a good sport and one who likes to be educated on anything I have an opinion on, I find myself on Monday evenings, on commercials switching back and forth between whatever shows I am watching, generally a basketball game or other sport, and WWE. Since the show is on for something like 3 hours there is always something I am able to catch. Last night before I slipped off to bed, I decided to catch the last 10 minutes or so of the program as I am sure that’s when all the good stuff is reserved for. As I watched I was discouraged and heavy hearted about the message such a broad-reaching program was sending to a generation of children facing the issue of bullying. Apparently Brock Lesnar, most recently known for being a beast in the UFC, has returned to WWE. For those who don’t know, Brock started in the WWE, left for the UFC, to prove his toughness, and most recently returned to the WWE. I’ll go ahead and temper by saying I don’t know a ton about all this, the story lines, etc. I do know John Cena is a big name because I’ve heard of him before. Apparently he is the face of the WWE. Last night I saw him wearing a “Rise Above Hate,” t-shirt. I’ve heard of his great humanitarian efforts and have seen his active hand in commercials for anti-bullying campaigns. Good for him. If he is the face of the WWE and this program is watched by this generation facing bullying than I am encouraged by his intolerance for it. Now back to Brock Lesnar. Apparently he wants to be the face of the WWE and yada yada and on the soap-opera-like drama goes. Not sure of all this, however, I did watch as the obvious antagonist of this story line behave in a way that actually encourages bullying rather than discourages it. Lesnar uses scare tactics to get a man, I’m guessing is his boss, to agree to a ridiculous list of demands before he would be willing to sign the contract to fight Cena. Lesnar stands center stage taunting Cena and calling him scared and little boy. Cena finally shows up to the ring and there is a huge tense stare down shared between the two. Lesnar continues with is bully-like actions demanding Cena sign the contract. 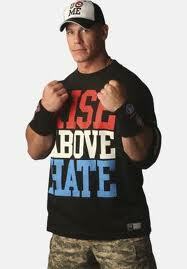 As Cena stood there in his Rise Above Hate t-shirt everything in me yearned for him to refuse to sign the contract. Lesnar’s power was in his ability to control a fight. That power would have been stripped from him had Cena just walked away from it, leaving Lesnar standing there, center stage, with no fight to manipulate. I so wanted him to Rise Above Hate and not sign the contract and walk away. Much to my disappointment Cena signed and the bully got his way. I was disgusted as I turned off the TV. I couldn’t care less about the WWE or this fight, however, I was quite disappointed by a media outlet as big as the WWE given the chance to put the bully to shame and not tolerate it, give it power and fail to show their audience something encouraging. Maybe it was to get people to follow the story line, but in that moment given the opportunity to send a positive message the WWE failed and that is discouraging. I’ve attached a video of what I saw last night if it interests you. I’ll say it here that I am all for anti-bullying campaigns and things that encourage or support bullying should be ashamed. Shame on you WWE.